Bad news. According to David Gardner, co-founder of digital media company ColorJar, no one cares about your company. The good news? There’s ways to make people care. And Gardner knows just how to do it. The Golden Purpose is a method he created with ColorJar to help companies rise above the noise. Gardner discussed the method at SoMe Digital Media’s July Insight talk, a monthly lunch-and-learn event that brings together Chicago leaders to engage with the community in meaningful dialogue about how social and digital media can grow business. 1. What is your remarkable ability? What is the one thing your company does better than anyone else? For Volvo, Gardner pointed out, it’s safety. Volvo has to compete with a wave of other car companies. But they’ve figured out that emphasizing one component was necessary for them to be seen. – Invent characters that exemplify your user personas: Build out a character profile for each of your top use cases. Include character name and job title, where they shop, hobbies, what websites they use, where they live, etc. This will help you see your users as living, breathing humans, as opposed to a statistic. More hard truths: No one is unique. 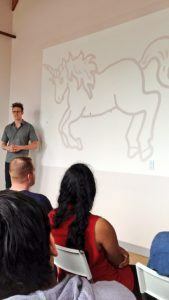 Gardner demonstrated this by showing one slide with an image of a unicorn. On the next slide, was the same image but with the horn removed; it was a regular old horse. Once you accept that someone else is doing what you’re doing, you can begin to do that thing better. How do you get really good at one thing? • SoMe Insight returns next month with a new dynamic speaker. Insight events take place monthly.